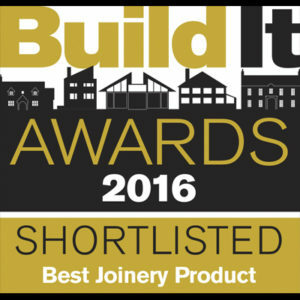 Build It have announced the shortlist for this year’s Build It Awards. We are are delighted to find out that once again we are selected as one of the finalists. Bisca were lucky enough to win in 2013, shortlisted in 2014 before winning again in 2015. This year we have entered with a magnificent staircase, in both scale and design. The staircase is in a light filled entrance hall providing access to first and second floors. Our designers modified the architect’s layout to increase the going of the stair for a more comfortable ascent. We also redesigned the landings for a cleaner, more contemporary look. We moved the foot of the stair in the hall back, therefore easing traffic flow through the hall and allowing better access to adjacent rooms. Stainless steel stringers support open treads of kiln-dried Ash at the upper levels, whilst a glass balustrade supports lower flights. The crystal clear low iron glass balustrade creates a floating appearance and a view through a glass wall to a living kitchen. Capped and slotted treads provided a fixing free appearance enhancing the clean lines of the stair. A circular section feature newel at the foot of the staircase provides a visual link between the helical staircase and balustrade. The newel transitions to a profiled handrail before continuing seamlessly through four flights to the upper landing. The opposite balustrade uses toughened and laminated glass for a contemporary, clean appearance.